Hello and happy Wednesday! This week has just flown by. I can’t believe it’s almost half over. Today’s project is a card we’re making at my Stamp Club meeting tonight. It’s really simple, but it has some really nice details. The center of flower is a piece of paper that was roughed up enough to tear apart and reveal the middle fibers which kinda looks like suede. The petals are curled up with the bone folder to give the flower more dimension. The Fifth Edition DSP is cut on the top edge of the Fancy Favor Die to give it that elegant edge. The Marina Mist cardstock is run through the Big Shot with the Elegant Lines Embossing Folder and one of my favorite details is that the greeting is on half a decorative label punch. Hope this card inspires you to get crafty! 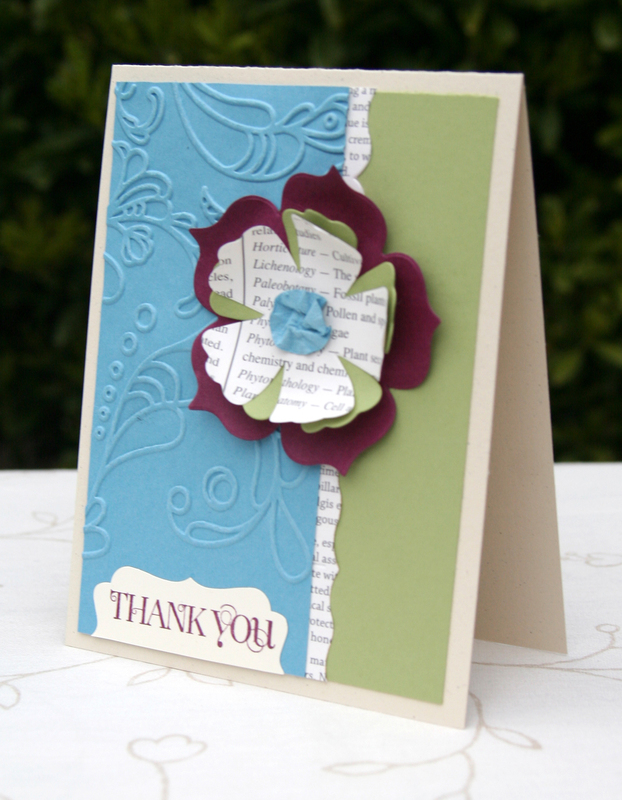 I love that embossing folder – it is so fun and elegant. love this card, the colors are great together.